Statistics are funny things because on the face of it a stat can sound really good, yet the stat alone is quite misleading. Sunderland's goals, I think, are a decent example of this. We have the second best goal difference in the league, the second best goals for in the league and the second best defensive record in the league. Slap our average points per game onto our total to replace our game in hand and, guess what? Yep, we'd be second. So that all sounds above board and reasonable. Yet I don't think it's that simple when explaining why Sunderland haven't been able to earn enough points to top the table after 26/27 games. We're the second best at not conceding goals, yet there are ten sides in League One with more clean sheets than us. SIXTEEN sides have more if you only include home games. 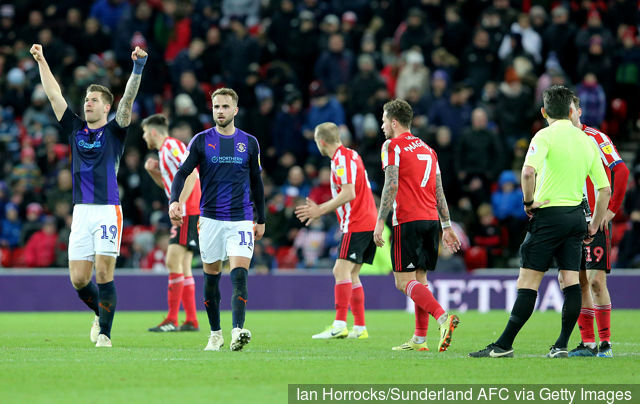 Combine that with the impressive stat that we haven't failed to score in any match so far and it is no surprise that Sunderland have been involved in more 'both teams to score' encounters than any other. 73% of Sunderland's games have had both teams find the net. Only four teams in the top four divisions 'better' that and, shock horror, none of them are in the top three of their leagues (Arsenal, Manchester United, West Brom and Forest Green). Our most popular scoreline? 1-1. 31% of our games have ended this way, and we lead the league in number of games drawn - which is what shackles us behind Portsmouth and Luton. We've let the opponent score first in 11 games, six teams have a better record than that and two with the same (both of which having played a game more). All sounds pretty crappy - so why are we 3rd? Well, by some distance, we are the best at responding to going a goal down. We've earned 17 points from that position, compared to the 11 of Luton who have the second best record (and we gave them one of those last Saturday). That trait has sweetened our more modest record for earning points after scoring first, where 12 (!) teams score more points on average when scoring first than we do. Our attack has come under some scrutiny recently, and that's fair enough as we haven't scored more than a goal in our last six league games. However, I think that if you want to win a title, or just automatic promotion, you need to back your attack with clean sheets. And that just isn't happening eventhough we've got the best keeper in the league. Portsmouth have more, Luton have more, Leeds have more, Sheffield United have more, Liverpool have more, Manchester City have more.